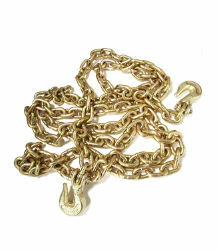 5/16" x 20' Grade 70 Transport Chain is a high strength chain made from quenched and tempered steel. Higher strength to weight ratio than standard carbon chain. Easily recognized electro-galvanized gold finish.